Made of London Fuller, Smith Turners iconic Griffin Brewery is a London landmark dating back to 1828 and still runs as London last remaining family brewery. At the Chiswick brewery beside the Thames many household names such as London Pride are brewed and shipped all around the globe. We had worked with Fuller previously at the site as well as on service and repair work. So we were called to site by their Engineering team to discuss some issues they had with their loading doors which they required a solution for. 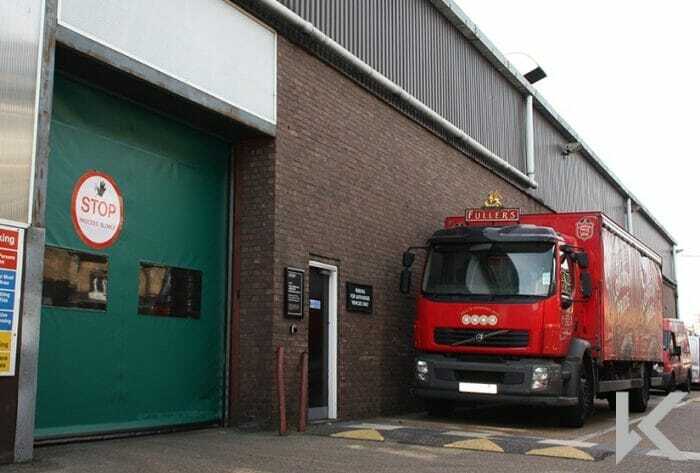 The three openings in question were from the warehouse to the external distribution yard. The doorways were fitted with speed doors which had become dilapidated and were now out of action, leaving the warehouse exposed to pigeons and other pests as well as the mercy of the British Weather! All three doorways were very busy with constant forklift traffic passing through. This meant the customer was very concerned as to potential damage from forklifts, as well as requiring doors which opened quickly and were suitable for high use. Tekta proposed our Rapidor Impact self-repairing speed doors as a potential solution for the project. After some discussions regarding the specifications Fuller commissioned us to proceed with the project. The client chose 'Opal Green' curtains as a good fit for their corporate image and the doors have robust side columns and hood/motor covers manufactured from galvanized steel. Rapidor Impact doors have zipper side guides allowing them to self-repair in the event of a forklift impact. The doors were installed at a weekend to ensure the minimum disruption to the Brewery busy operations. Operation of the doors is by a magnetic floor loop to either side of the doors which allows reliable opening for forklifts and the doors are set to time closed and minimise the risk of pest ingress. Were pleased to report that the Rapidor speed doors are coping with the constant flow of traffic. Tekta are very proud to have worked out on this prestigious project and help to facilitate the continuing supply of some of Englands favourite beers! Tekta "take pride" in Rapidor installation at The Griffin Brewery!